Buzzing about the Catholic blogoshpere yesterday...I came across this on Jimmy Akin's Blog. Not only is the post, written by Steve Greydanus of Decent Films, a great read, but the comments are also worthwhile, as of this writing, each and every one. We were musing the other day about Harry, one of our favorite characters in a picture book. It all starts with Harry and his bath...he runs away to avoid bathing, and gets very dirty, changing from a white dog with black spots to a black dog with white spots. His family does not recognize him. Poor Harry! It's Harry, it's Harry, it's Harry!! ETA: It worked ;) . I hope any Icelanders who popped in found something more than a test to enjoy. If not, my sincerest apologies for wasting your time. This is the number of students in high school who admit to cheating, according to a recent study. Pretty grim, eh? This is not a recipe. It was an accident. I must be sicker than I think. I poured some seltzer into a mug and took a sip with a couple of Advil. A few minutes later, I decided to make some coffee-in-a-bag (note to purists: It's dreadful, but it's quick. I keep it on hand for times when the coffee press is waiting to be washed). Seeing what appeared to be half a cup of water sitting on the table, but having forgotten about the seltzer, I topped if off with water, set the coffee bag into the mug, and microwaved it a bit. It was really strange and bubbly. Like a hot Manhattan Special, light and sweet. I think I know what it was like. 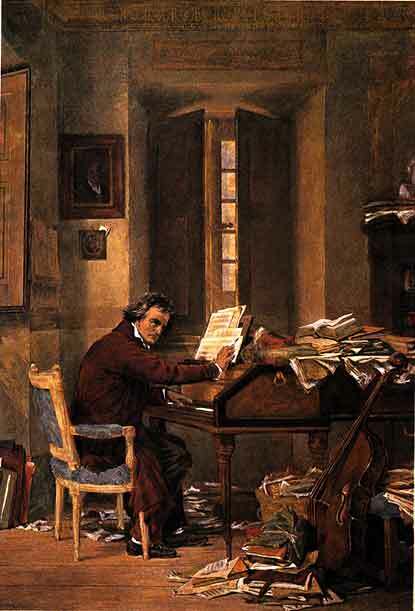 I have a cold that has settled neatly in my ears in the form of fluid, and I was listening to a Beethoven Sonata tonight. It was unbearably muffled; I could not hear most of the range of the music, but only had bits and pieces come to me clearly. I think I get it now, in a whole different way than a hearing person does. I have always thought I would rather be blind than deaf. It frightens me to lose even some of my hearing...hopefully, this fluid will drain, and I'll be back to normal soon. I like this painting because it resembles my living room. The cello leaning against a bench; sheet music is covering the piano and floor, in piles or strewn haphazardly; the afternoon light coming in the windows--just like home! Only there are no composers here. Unless they are Haydn. Wake up to news of a bomb in Times Square. This news prevents you from rolling over and going back to sleep. Beg a ride into the city since the trains may or may not be running. Arrive at audition site three hours early and rehearse with accompanist. Go to ATM and get money for accompanist's fee. Notice GAP across the street. Run in and browse. See a dress you love. Try it on. Buy it with accompanist's fee. Go to grocery shop next door and buy a banana and "B-Relaxed" vitamin water. You have heard these will help you remain calm for auditions. Go back to audition site. Do a quick run-through with accompanist again. Pay accompanist before you buy something else. Sit with mom in special parents' waiting room and gather thoughts. Be encouraged when a complete stranger recognizes you from a performance two weeks ago, and tells you that you are wonderful. Go to audition room at the 1 hour early mark, as instructed, to check in. They tell you to come back after lunch. The monitors are hungry. Meet a friend from California who is auditioning, too. Rejoice in your reunion. Go back to mom and sip vitamin water. Totally forget about the banana. Go to audition room and audition for panel of judges. Play your best, ever. The panel are very nice; they smile and clap at the end of your audition. Go back to parents' waiting area. Attend PowerPoint presentation on student life. Look at watch. Realize you have to get to work soon. Rush for train, now running on time. Make train, just as doors close. Get to your stop and decide to walk 5 blocks instead of taking the bus. It's a beautiful day!! Arrive at work, and get yelled at by a mother for your inadequate preparation of her child for a music test. Cry. Director of the music school tells you not to worry about it. Worry anyway. On your way home from work, get a call from your studio teacher (who was on the panel); she tells you you did well. Laugh. Smile. Sleep well or the first time in weeks. Amidst all the audition craziness around here, I forgot to post about the most important event of the week: Annika's Confirmation! Libby and Annika head over to the church. Libby was Annika's sponsor! The girls with the parish priests and the bishop, and the boys who served...two brothers and a cousin! Hey friends and family! If you have a second today or tomorrow and can say a quick prayer for Libby's audition, I'd really appreciate it. Thanks so much!